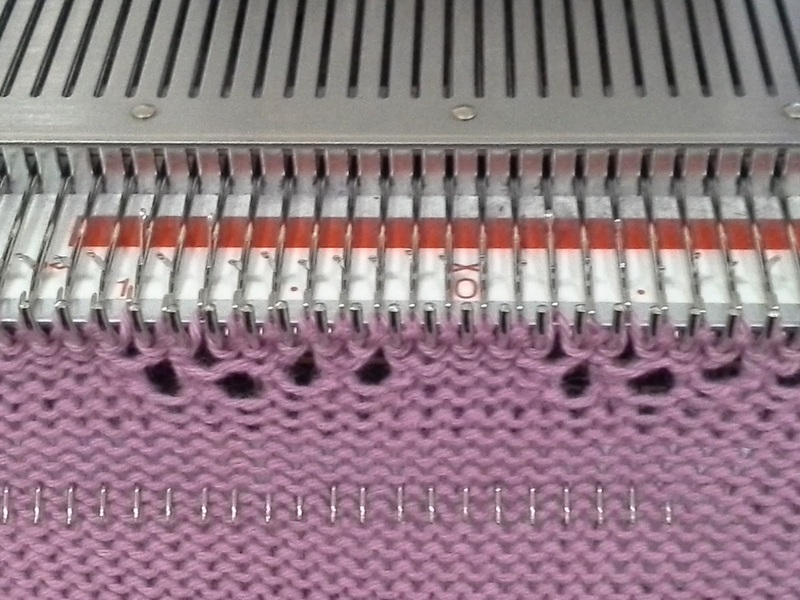 I'm doing a run of lace projects on my SK280 + LC2 and I've been experimenting with fixing dropped stitches. I had done.. maybe 16 rows and I noticed a dropped stitch 4 rows back and decided to see how difficult it would be to rip out 4 rows of 100 sts. So.. If that happens - rip it back to the start and begin again. 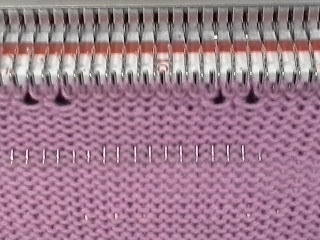 Time to undo and fix - V - time to go back to the beginning and reknit has to be considered, but checking every 2nd row worked really well, especially essential to check where there are 4 + transfers in a row. 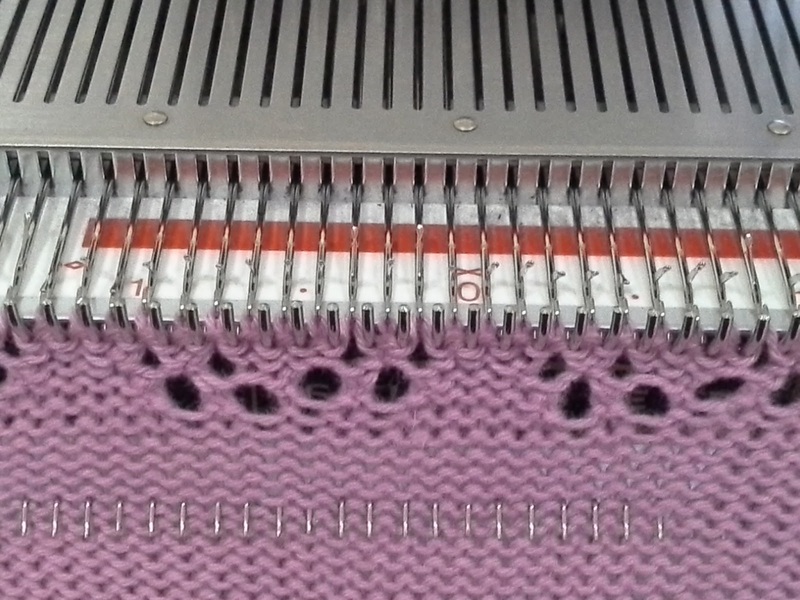 By the time I was working on the last piece, with no more dropped stitches, I made sure I had evenly distributed weight along the entire width and moved them up every 20 rows. 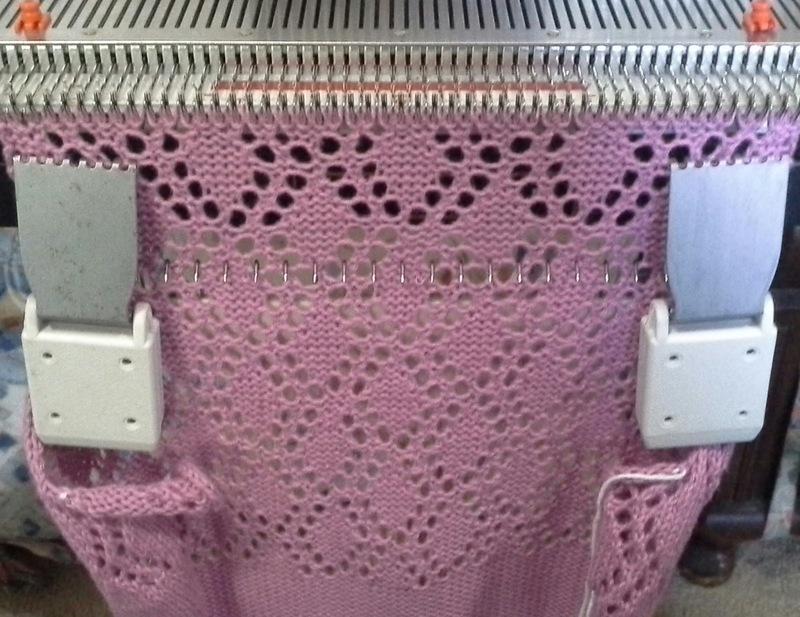 No dropped stitches at all in the pieces knitted. However if it's at the end of a piece, I think it would be less effort to rip them out. 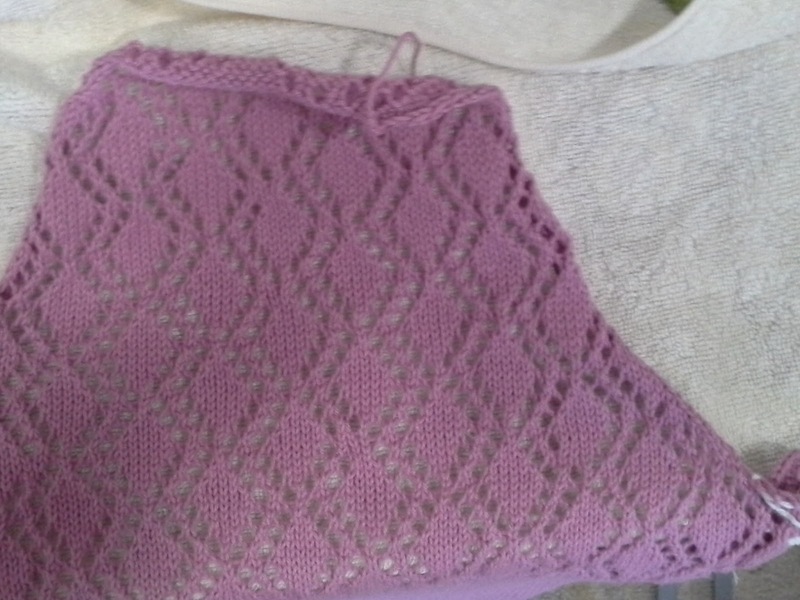 I did try to drop down and reknit - it would be OK in certain circumstances, but I noticed that the dropped stitches were mostly on the multiples of 4 transfers close together, not very helpful place to drop stitches, so ripping back was better. 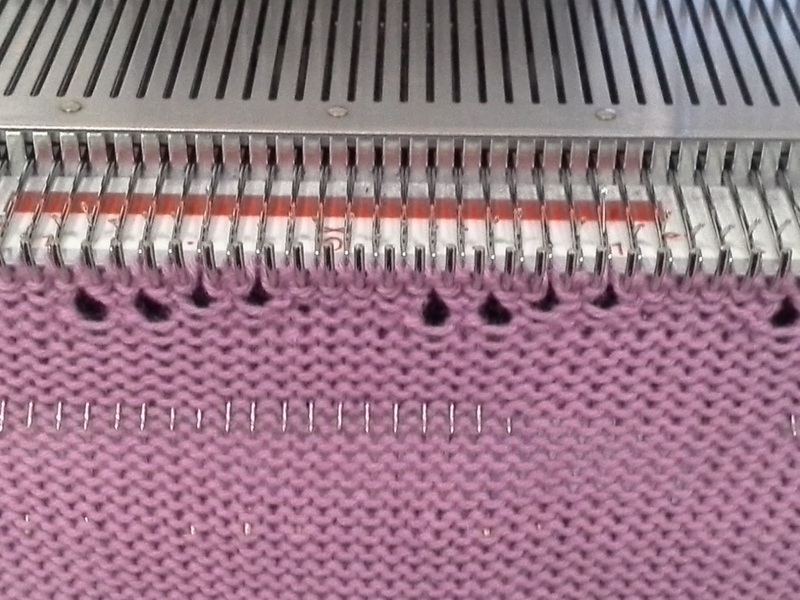 I decided to take photos of exactly what happens when rows are being knitted, to make it easier to rehang correctly. 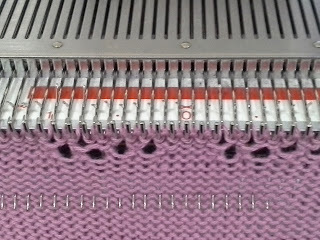 Row 1: travelling right to left- stitches are transferred first, the yarn trails and knits AFTER. 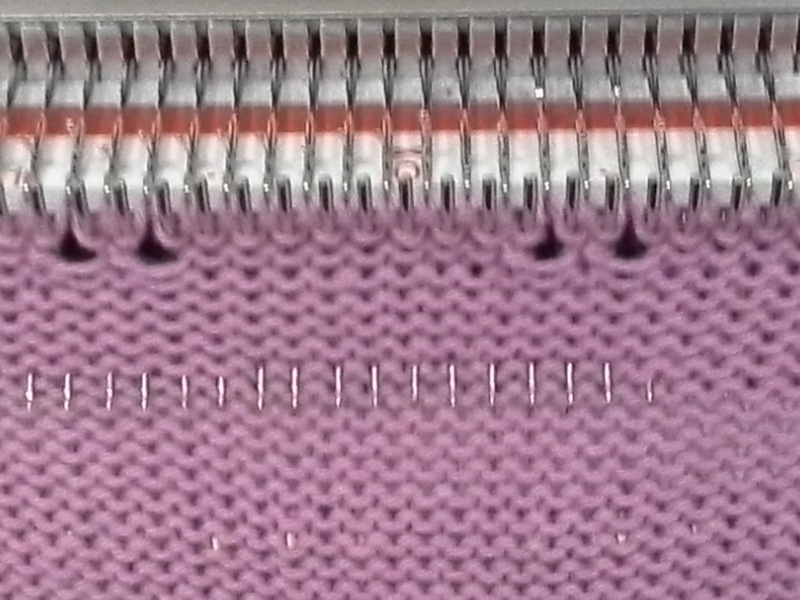 The stitches are only transferred to the left and the empty needle has the single thread on it. 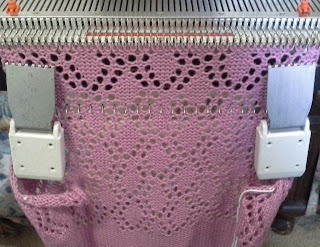 Row 2: travelling left to right -stitches are transferred first, the yarn trails and knits AFTER. 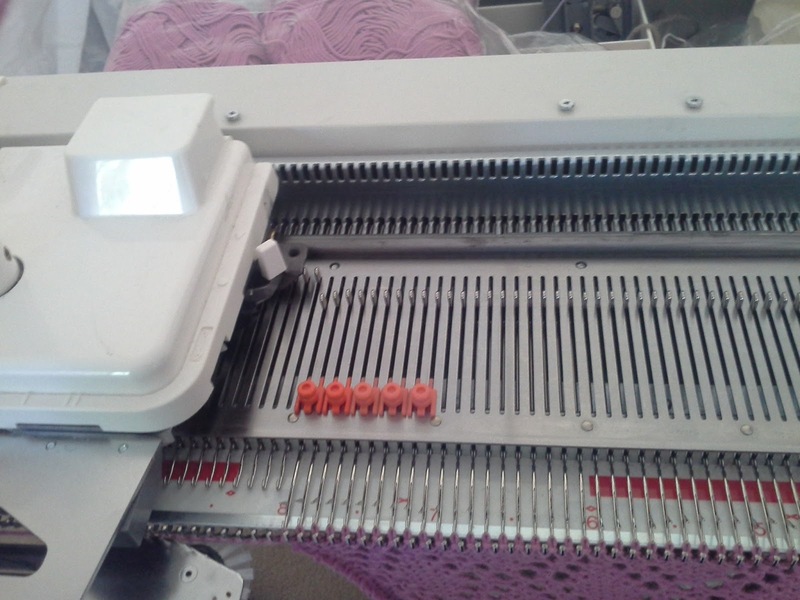 The stitches are only transferred to the right and the empty needle has the single thread on it. 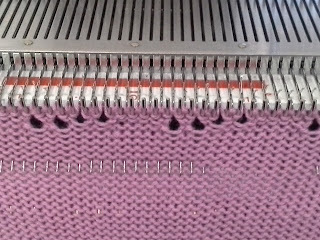 the card in the reader is all ready to knit the next row and needs to be memorised. For reference Rows 3 and 4. I dropped a great deal of stitches on the back, so I workshopped the sleeve to see how to work more weight. 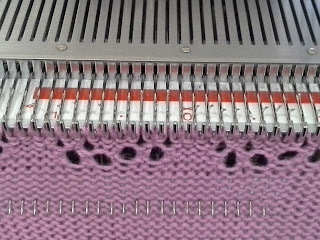 I noticed that the action of knitting was dislodging the bar weights, so I tried putting them on from the back, tried out the triangle weight with the small weight and the caston bar from Bev. The triangle weights added on the back worked so much better, no dropped stitches at all on the sleeve, so I redid the whole lace section of the back - well worth it, as there were way, way too many to fix. However, one stitch that isn't out of position and hasn't got any dropped stitches, it's just as easy to catch it up from the back. I've done just a few on my Zora, that popped up after wearing. 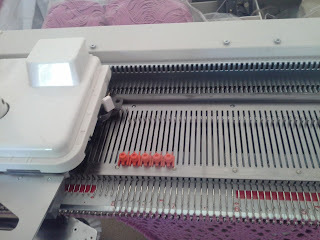 I tried out using the little orange men in a row so it didn't knit the stitches on the left that I wanted to take off for the initial armhole shaping. Thanks for all the good info you're putting out. Your lace projects are going to be really nice. Thanks Sandy, the notes are for me. I don't do lace all the time and I forget between them.